1 Brush Initiative is a San Francisco-based non-profit that facilitates public art projects and empowers youth by giving them access to hands-on arts education. 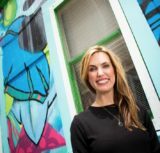 The initiative’s goal is to create a street art museum experience in San Francisco while also supporting underserved youth. 1 Brush recruits professional artists to lead workshops and mentor young people at underserved schools and in the juvenile justice system. Through their educational and public art endeavors, they hope to give youth the tools to express themselves in positive ways and brighten San Francisco’s neighborhoods with engaging public art. Mission Statement: Beautify, integrate and foster the diverse culture of San Francisco through the use of art.